Thorpeness Golf Club is home to an incredible s golf course, designed by James Braid, who is renowned for some of Scotland's best layouts, including Carnoustie. In the heart of Suffolk, Braid has created a magical golf course, where golfers will wind their way through stunning heathland while contending with gorse, heather and pine trees. Thorpeness Hotel is located on England’s majestic east coast, nestled in an ‘Area of Outstanding Natural Beauty’ and only 5 minutes from the beach. The hotel offers golfers charming bedrooms, with Ogilvie’s Grill House on hand to provide delicious meals. This Suffolk gem is heathland in style, and though not long - measuring 6,432 from the tips - is a fantastic test. Visiting golfers will be charmed as the layout winds its way through silver birch and pine, gorse and heather, in a fashion reminiscent of the world-renowned courses at Sunningdale and Woodhall Spa. 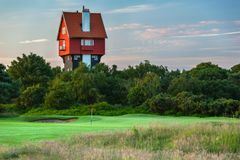 The sandy soil gives Thorpeness a superb links accent, while the course's quality has been recognised with the award of a number of regional, national and international tournaments. The charming Suffolk landscape makes for a delightful setting, while on the course itself Braid has created a great variety of holes. Some of the best are the signature 3rd, where a good drive is the key to negotiating the sharp dog-leg right, the short 7th, where a poorly-struck iron will disturb the lilies that cruise the lake, and the terrific closing hole, which demands two great shots to find the green, under the watchful gaze of the famous windmill. James Braid's famous creativity is extremely evident at Thorpeness, and his tremendous course makes this an educated choice for your next golf holiday. It is crucial to avoid the bunkers at Thorpeness, which are built in the true links style with steep faces. Just ten minutes walk from the superb beach on Suffolk's famous coastline, the hotel prides itself on providing traditional hospitality for all those fortunate enough to visit. The thirty guest rooms are extremely comfortable, and all overlook either the Meare or the golf course. Old-fashioned values like personal, attentive service are married perfectly with modern comforts in the hotel, and the warm welcome will ensure that all visitors will be put at ease immediately upon arrival. During the winter months, the golf course's sandy turf remains perfectly playable, while the open fires will be roaring in the lounge to greet the hardy golfer's return, emphasising perfectly the charm inherent in a Thorpeness golf break. Hotel guests are welcome to rack up the balls for a few frames of snooker, or use the golf simulator, while the Meare and its surroundings offer a variety of pursuits: try rowing, tennis, boating, fishing, cycling or clay pigeon shooting. Overlooking the 3rd tee, Thorpeness' restaurant is a sumptuous experience, where the ever-changing menu reflects the fresh and seasonal local produce. The Patio Bar serves drinks and fine light snacks, including homemade Thorpeness fishcakes. Perfectly acceptable and good accommodation. Clean and warm, plenty of towels, all good. Easy and free wifi access. Impressed with the choices, and the quality, of the selected menu. Helpful staff, friendly too. Very impressed with the rooms, shared with my son. Twin beds comfortable and room size larger than expected with writing desk and large sofa to relax and read or watch tv. The room seemed very modern and bathroom of a high quality. We ate in the bar rather than the restaurant (wanted to watch England v Spain), the staff were really friendly and helpful and our food was enjoyable and well presented. Service overall was good. Very pleasant stay at Thorpeness, big & comfortable rooms with all the basic amenities you would typically require available. Dinner was excellent and breakfast set you off ready for the day ahead.Prices very reasonable in the bar. My husband Alan and I thoroughly enjoyed our 3 day golfing break at Thorpeness Hotel & Golf Club...just what we needed! The hotel staff were very friendly and helpful to make sure we were well looked after. As for the golf, well – the course was in great condition, not a bit of mud on our shoes or trousers after we played 18 holes; it was a pleasure to play on! We will certainly contact Your Golf Travel when we decide to go on our next golfing holiday. I really enjoyed this course. A great test for a mid-high handicapper with lots of well-placed bunkers and with good, fast greens. Very pleasing to the eye from the tee box, with the fairways framed by the yellow gorse. After 4 months of walking my own (very wet) course in Kent it was a pleasure to walk along dry, springy fairways. We played as a two ball and took about 3 hours 15 minutes for each round. We were invited through by slower groups on several occasions and found other players to be courteous and friendly. The course was set up very well with an abundance of bunkers some of which I avoided. Sadly not all! The course requires a strategic approach, it's not overly long at 6,000 yards but course management is critical to score well. We were fortunate with the weather and saw the course and surrounding Vista at its best. The greens were slower than we were used to but they were very true and freewheeling staff are to be congratulated on presenting the course so well at this time of the year. We will definitively return in the future and found the two days to be really enjoyable. Thanks to Sam Greenslade for organising our break, he was very helpful and cannot speak highly enough of him and his customer service. Great track, one that really gets you thinking! As with every course in the UK this summer, suffered a little on the fairways but you can see it growing back. Around the greens it's excellent and one of the few places you can putt confidently knowing you're getting true roll! A really well laid out test that provided a good challenge for our group. Sadly the weather got the better of us on the 2nd day and whilst the course stood up to it absolutely fine being sand based, less could be said for the wimps trying to play in it. Even with that in mind we'd 100% come back here again.